Thanks so much for following my Instagram and adding so many comments. I guess my photography differs a lot from the New England landscapes, architecture, and flowers that our Dad photographed. Stylish Asian girls in New York City: how much farther could one get? Somehow it just evolved. In 2013, I began a walking exploration of The Bronx, using a camera just to document my travels: the buildings, the graffiti, and the general cityscape. People, not so much. I was using a nice little compact Sony camera, with a built-in zoom lens and (in my ignorance) a tiny sensor. In July of that year, I was examining some photos of monkeys at the Bronx Zoo. As I zoomed in, the images seemed extremely grainy and to lack detail. I still have a 16 by 20 inch photo that Dad took of the Rose farm in Bolton. It is sharp as a tack, even at that size. Dad was a perfectionist and I could not hope to match his results, but my monkey photo was grossly inadequate. So I studied up and learned that sensor size makes quite a difference. Thus I bought a Nikon D5100, with a much more respectable sensor size. Continuing to explore The Bronx in late 2013, I got some decent images. My photography teacher, Howard Goodman, exposed us to many different aspects of photography. Among other things, he showed us a video of some old guy named Bill Cunningham, who apparently made his living photographing “street style” and fashion for the New York Times. Howard also recommended that those of us who were interested in photographing people, but might be reticent and unsure of where to start, that we try attending open, public events, where the people are open, doing something interesting, perhaps are dressed up, and amenable to being photographed. I filed away these tidbits and recommendations. Ha! One day at NYFW and it was all over. Instead of trying to photograph ordinary people in The Bronx who didn’t want to be photographed, Fashion Week was swarming with beautiful people who positively DID want their picture taken. That Fall, after Fashion Week concluded, I started to walk around Manhattan, looking for street photography. At first I was not focused on “street style,” but rather on general street life, more like Henri Cartier-Bresson than Bill Cunningham. Perhaps it’s an excuse, but modern New York City just does not seem to offer the lively variety of experience that HCB captured. Everyone is just walking, standing, using their phone, eating, or (maybe!) smoking a cigarette. One time I got a picture of guy tying his girlfriend’s shoe! That qualified as a photo-worthy event. Still in Manhattan, I wanted to pursue street style, where, at least, the subjects would be intrinsically interesting. But, outside of the receptive venues of New York Fashion Week, I was still struggling to approach strangers. I photographed dogs, storefronts, and a few people, in a rather unfocused manner. Then I ran into Mangue Banzima, an accomplished street style photographer. Ebullient, helpful, gregarious, and supremely confident, he showed me how it was done one Sunday afternoon. (Again, to be precise, I met Mangue in Williamsburg, Brooklyn, a neighborhood that is essentially an extension of Manhattan.) 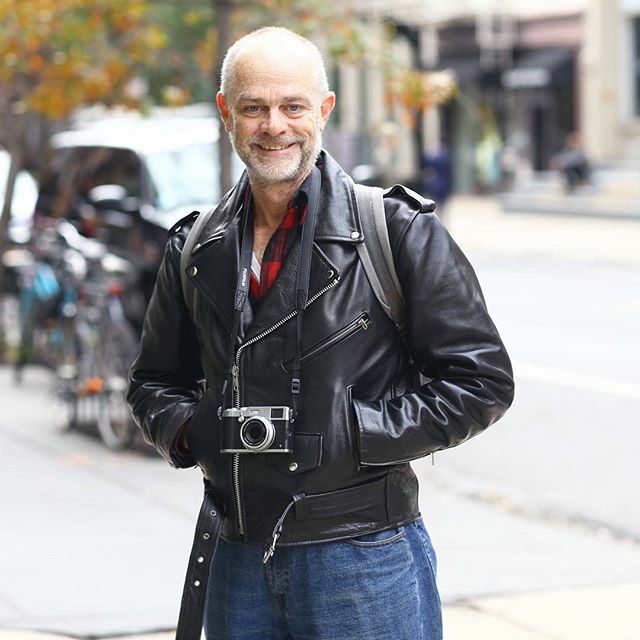 He spotted his subject, took her picture, and then asked, “Excuse me, Miss, mind if I take your picture,” while showing her the picture he had just taken on his camera’s LCD. If they agreed, he would take a few more shots; if not, he already had one or two. “They can say ‘no’ all day long, I’m gonna get my shot,” he explained with his typical bravado. Also in the late Fall of 2014, in addition the my lesson from Mangue, I learned that Soho and the nearby neighborhood of Manhattan offer, by far, the richest opportunities to see stylish and fashionable people. As for Asian girls, while I am often accused of “yellow fever,” in fact, that just happened. First, I quickly noticed that Asian girls are better dressed, on average, than white girls, at least in New York’s trendy neighborhoods. And that does not mean Chinatown, which is a wholly different, and distinctly un-stylish area. Secondly, they seemed much more receptive to having their photo taken; white girls are much more likely to respond negatively. So, I feel a bit like the lab rat, who has a red button and blue button in front of him. When he pressed the red button, he gets a treat, the blue button an electric shock. So the lab rat quickly learns to press the red button. So it is with me and my street style subjects. Bill Cunningham passed away a few months ago. And it would be presumptuous of a late-starting neophyte like me to aspire to be “the next Bill Cunningham,” so I will have to content myself with being the best Stephen Sherman I can. This is exactly the info I was looking for! Thank you so much..more in a personal email.